I found this recipe in "The Art & Soul of Baking", a fantastic book from Sur la Table - it's basic enough for new bakers to get a handle on, but detailed enough for us wannabe pros to get a lot out of it. It reads like an instruction manual, in every wonderful geeky way that's possible. The book's got a lot in it for me to discover; the recipe below was my first find, and I like it a lot. I decided to literally go "by the book" and not skip on any instructions: I warmed my eggs to room temperature, creamed my butter and sugar together much longer than I usually have the patience for, and alternately added the dry ingredients (sifted, of course) and the sour cream to the creamed sugar and egg mixture - the resulting batter was surprisingly uniform and airy. "Surprisingly" because the cupcakes are rather dense - again, in a good way. The frosting recipe didn't go along with the cake in the book, but I thought something lemony would be nice for springtime. The reason I'm calling this "citrus" is because you can use orange, lemon, or even lime if you'd like - all would work well. In all honesty, I'm not 100% sure I actually used a lemon, as it was rather green on the inside. "Citrus" is a nice safe word. Enjoy! In a large mixing bowl, cream together butter and sugar with an electric beater until smooth, 4-6 minutes. Add eggs, one and a time, and incorporate. Add vanilla. In a separate bowl, sift together flour, baking soda and salt. Combine dry mixture and sour cream into wet ingredients, adding 1/3 dry mix, then 1/2 sour cream, then 1/3 dry, then the rest of the sour cream, then the rest of the dry, fully incorporating each addition before adding more. Using a small scoop or pipping bag, pour batter into cupcake papers, filling each about 2/3 of the way full. Bake for 16-20 minutes, rotating cupcakes once during cooking. 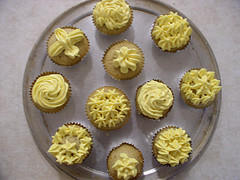 Cupcakes are done when slightly springy to the touch, and when an inserted toothpick comes out clean. Allow to cool completely before decorating. In a mixing bowl, cream together cream cheese, butter and 2 cups of powdered sugar, and beat with an electric mixer until combined. Add juice of one lemon (or other citrus), careful to avoid seeds. Combine, adding more sugar to reach desired consistency. Add several drops of food coloring, if desired. 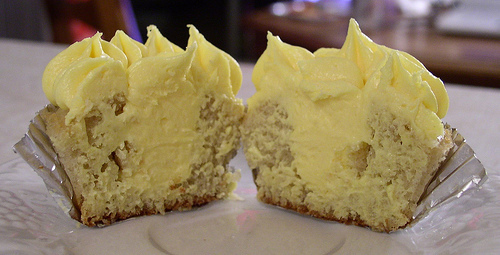 To fill, carefully cut out a piece of the center of each cupcake after cooling, and fill with frosting. You can replace the "cap" of your cutout if desired. 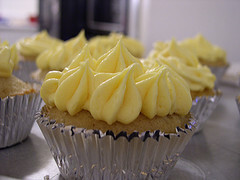 Frost the top of each cupcake using a large, flat knife or spreader, or with a pipping bag. Thoughts and Observations: You certainly don't have to "fill" these - it's a bit of extra work, and the frosting is rich enough without adding more. But it makes a nice presentation and surprise on the first bite. I realize my frosting recipe is kinda basic - frostings are next on my list to experiment with (before research, I had no idea a lot of frostings had heat involved at any step - color me surprised). Play around with it, remembering that you can always thin it out with milk, and thicken it up with powdered sugar. You can also go all butter and no cream cheese - I just happened to have some handy, and like the taste. Purists might be blowing a gasket at all this, but they can yell on their own food blogs. I added yellow color purely for show. I didn't do it for these pictures, but a garnish of finely grated lemon rind would round these out nicely. This page contains a single entry by Michael Doss published on March 26, 2009 5:09 PM. Burrito Based Economy was the previous entry in this blog. PETA is the next entry in this blog.